Emma had a big check-up at Davis a few days ago and as always, she exhibited her signature blend of sweetness, bravery, wisdom and mellow enthusiasm. We learned that the chemo isn’t working but that’s not surprising…..we already knew that it usually isn’t effective for her type of cancer. But we had to at least give it a try. On the bright side, the cancer has only gotten slightly worse since her last big check-up two months ago. The oncologists think that she could have a few more good months with us but we’re still hoping for a miracle and that she’ll defy the odds! We will probably try some acupuncture and holistic supplements too…….but for now, Emma is going to spend her days being a dog, NOT a cancer patient. And that’s just fine with her! P.S. 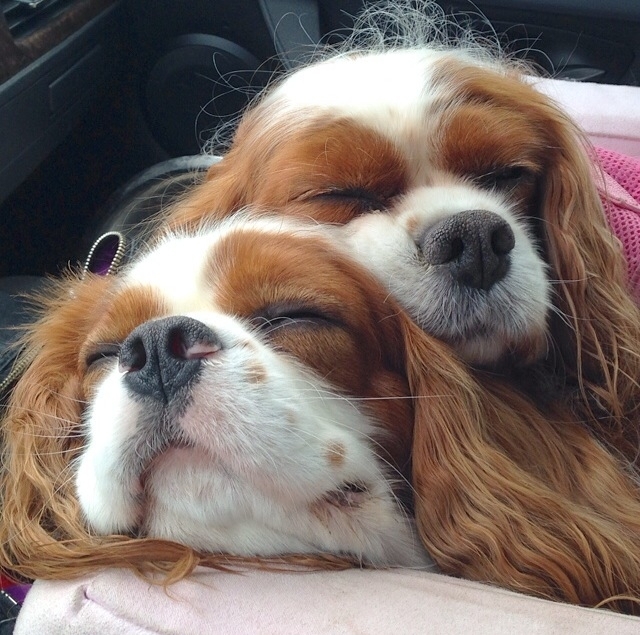 Emma used her fuzzy, baby brother, Baxter as a pillow on the long car ride home from Davis and I’m not biased at all but I’m pretty sure that this is the cutest picture in the history of EVER!